You are here: Home » BREAKING! 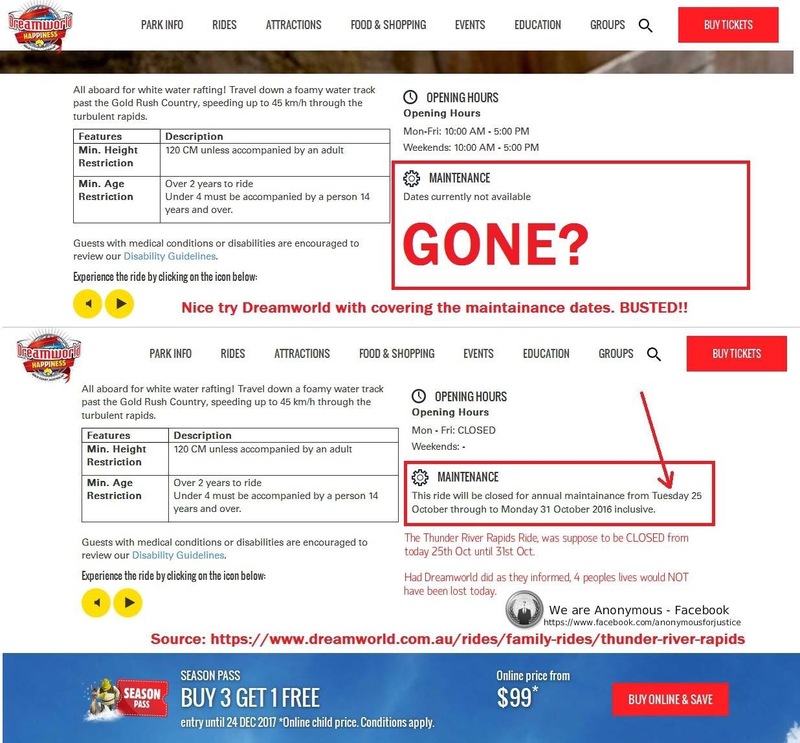 Dreamworld Tragedy – Coverup Underway? BREAKING! Dreamworld Tragedy – Coverup Underway? Could this tragedy have been avoided? What if the ride was supposed to have been closed today? Today was a very sad day and certainly not a day anyone could have dreamed up. Theme park goers often joke about being stuck on a roller coaster mid-loop. And sure, that has actually happened to people. But the tragedy today was more a nightmare than a dream. Four people lost their lives today when they were nearly finished having their turn on the Thunder River Rapids ride. One of Dreamworlds oldest running and popular attractions. Even this author has fond memories of many a ride down the rapids getting soaked and laughing with family and friends. But did it have to end in tragedy? Is it possible that this disaster could’ve been avoided? It appears that may very well be the case. What if we told you that the ride itself wasn’t supposed to be open today? What if we told you that it was scheduled for maintenance from today October 25th, 2016 through to October 31st, 2016? If that doesn’t get you wondering that somethings not right then what if we told you the Thunder River Rapids ride webpage was updated at approximately 6:30pm tonight that removed any mention of the ride supposed to have being closed for maintenance? Well the Anonymous group claims to have saved a screenshot of that very webpage before it was updated! If it’s a hoax and it’s a fake screenshot then fate will be to blame for their tragic deaths. If it’s real then let’s hope it makes its way to the light so the truth can be seen. Either way, Dreamworld management have some explaining to do. Don’t you think? No it wasn’t. I’m in contact with the guy who screen capped the original. Amazing how Deborah Thomas took in Tori Johnston’s father after the Sydney Siege (yes i know it was a hoax) and now she’s getting a nice little bonus oayment for her role in another scam. She’s just another puppet told what to do by the Zionists.